My last three events ALL SOLD OUT!! I’ve had such tremendous growth that I’ve actually had to hit pause on my offerings to regroup. I was feeling isolated, irrelevant, broken and I desperately needed to figure out how on earth I was going to provide for my family in Venice where the cost of living is bigger than I have ever experienced in my life. I had moved from Canada only four short months before I got pregnant and literally moved a decimal point over in my rent. It was 10 times what I was used to paying, so I knew I had to change something major in my business. My last three events — two retreats and a yoga teacher training — ALL SOLD OUT!! I went from $0 to making an additional $1,000 a month from online nidras. I was asked to teach a Oregon Eclipse festival at an incredible 300+ person class. 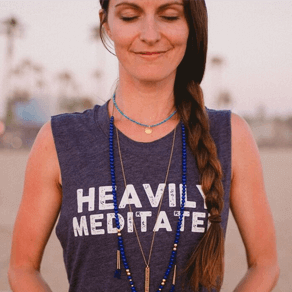 I was invited to share my nidras on Insight Timer, which is the #1 top free meditation app AND I became one of their first paid content creators! I’ve had such tremendous growth that I’ve actually had to hit pause on my online offerings to regroup and implement MORE of what Marie suggested to make my work even more efficient. This year I have already published and SOLD OUT of my first astrological calendar, and I’ll have an e-book and a subscription-based offering which is a HUGE WIN!! I’m stoked! It used to be that three days a week a nanny would be there when my son woke up, and my husband or a nanny would put him to bed five nights a week. I’d often have a movie playing between school and dinner while I finished up on emails or took just one more call. Now I get to wake up with my kid every single day, play, eat breakfast together, bike him to school AND pick him up every day, eat dinner with him five nights a week and put him to bed. His confidence and social behaviors have improved so much having me around more than all of his teachers have made a point to tell me what huge improvements they’ve seen in him at school. There is no price to put on that win.